Who better to go on an adventure with than your pals? Adventuring with your friends is probably the best way to go adventuring if you think about it. Going with anybody else would be madness. Plus, The Adventure Mortal Enemies doesn’t have such a great ring to it. 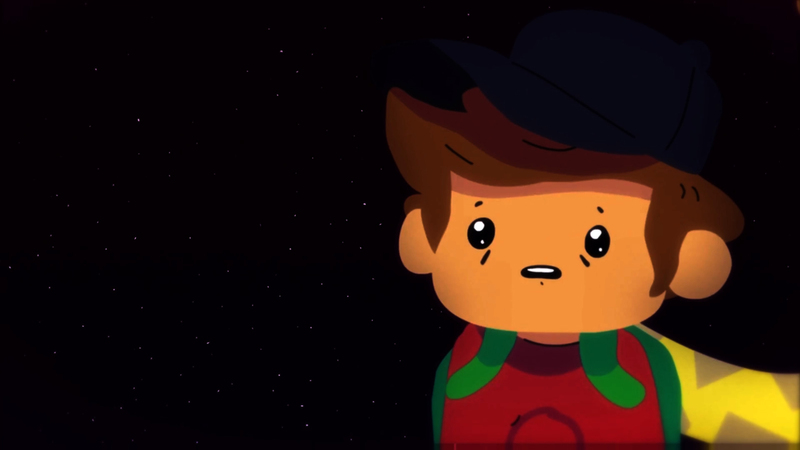 Fortunately, then, Massive Monster’s The Adventure Pals puts you in control of a young lad who is already wise to this. The world is in a bit of a pickle after the nefarious Dr. B starts kidnapping folks and turning them into hot dogs. Yes, hot dogs. Relishing the challenge ahead and as keen as mustard, the pals – a boy, his pet rock, and a giraffe named Sparkles – have a frank conversation and decide to get off their buns, setting out to rescue those who would otherwise end up being somebody’s lunch. But, will this intrepid crew be able to ketchup and save everyone? Everybody is on their side of course, with the various townsfolk providing limited assistance along the way. After all, nobody wants Dr. B to be declared the wiener. Rescuing your papa involves traveling around the platform-based game world with the eponymous pals, using your trusty sword to hack your way through the plethora of enemies who are all seeking to halt your progress. The sword isn’t going to get the job done alone though, so it’s handy that your crew are on hand to help. Sparkles and The Rock (not that one) are incredibly useful, helping with attacks without you having to do much to encourage them. As a bonus, they’re able to be used in some of the puzzling situations The Adventure Pals throws your way. The rock can be thrown at a distant switch for example, while Sparkles can use his mouth like a wrench to turn handleless levers. Stages are broken up into a series of five or so levels, with the completion of the full set rewarding you with rubies, which are handy to have when it comes to paying ransoms or buying people off. Optional collection challenges involving a sticker book and a series of cupcakes are on hand for completionists and encourage repeated plays. The cupcakes can even be fed to a bird who converts them into eggs that hatch to reveal new hats and outfits for you and your companions. I know I can’t be the only person who would appreciate a bird who could turn a pile of cakes into a shiny red fez. Individual levels consist of defeating enemies, clearing paths, and finding the exit – as you’d expect – with some very, very light puzzling built in to hinder your progress. Regarding troubling the old grey matter, hitting the correct switches to remove obstacles is about as taxing as The Adventure Pals ever gets. This relatively smooth path, combined with some very mash-happy combat means your progress through the game is never really in doubt. When facing a wall of enemies, you can usually get away with hammering the square button until everything is dead. Even with that in mind, all sorts of assists are available when it comes to dispatching enemies. From being able to cannon exploding bad guys into one another to being able to do away with some enemies in true old-school head-stomping fashion, clearing the waves isn’t massively taxing. Larger foes who take a little longer to take down even come with a generously early warning icon to let you know when to dodge their attacks. The game’s main bosses are trickier customers, but even beating them is simply a case of staying out of the way until the time is right to carry out an attack. Leveling up provides the option to unlock further abilities for you and your pals, with some proving to be far more powerful than they ever should be. Being able to give the giraffe the ability to grab on to your opponent and pull them back toward you to allow you to extend a combo is a bit of a bridge too far. Along the way, there’s always the slight suggestion that at some point, The Adventure Pals will become a really tough challenge. You expect to reach a point where you’re having to replay levels because you keep misjudging that one set of jumps or keep getting overpowered by your foes. But, the platforming – despite some Flinthook-esque swinging shenanigans – never really becomes challenging and the constant improvement of your character means that you almost always feel overpowered. What this does mean for The Adventure Pals, is that it’s a joy to play in co-op mode since you’re always making progress. If you’re playing with a less-experienced player, it’s nice to have a game that doesn’t present mountainous difficulty spikes that destroys their enjoyment, while not being so dull that the more experienced player loses interest. In many ways, the game is perfect for a couple who just want to fire up a game and have a bit of relaxed fun. This doesn’t mean that all is lost for lone adventurers, however. 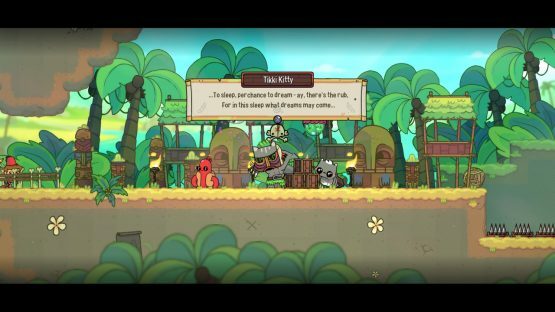 With a debt being owed to Castle Crashers and Adventure Time in terms of both humor and visual style, The Adventure Pals has enough going on to keep you interested during the slightly more repetitive sections of play. Had it packed more of a challenge – even if it was optional – The Adventure Pals would be running close to the front of the indie platforming pack. Though the final product doesn’t quite get there, it’s still plenty enjoyable, especially in co-op. The Adventure Pals review code provided by the publisher. Version 1.02 reviewed on a PlayStation 4 Pro. For more information on scoring, please read our Review Policy.